Although authentication and authorization are distinct concepts, they are often linked. Many modules written to handle authentication also handle authorization and vice versa. There are two kinds of certificates: self-signed certificates and authority-signed certificates. A self-signed certificate uses its private key to sign itself; that signature is unverified because it is not connected to a chain of trust. An authority-signed certificate is a certificate that is issued to a party by a certificate authority, CA, and is signed by that CA, for example, VeriSign, CAcert, or RSA. The CA verifies the authenticity of the certificate holder. Single sign-on (SSO) allows principals authenticated to one resource to implicitly authorize access to other resources. If a set of distinct resources is secured by SSO, a user is only required to authenticate the first time they access any of the secured resources. Upon successful authentication, the roles associated with the user are stored and used for authorization of all other associated resources. This allows the user to access any additional authorized resources without reauthenticating. Non-clustered SSO limits the sharing of authorization information to applications on the same virtual host. There is also no resiliency in the event of a host failure. In a clustered SSO scenario, data can be shared between applications on multiple virtual hosts, which makes it resilient to failures. In addition, a clustered SSO is able to receive requests from a load balancer. Simple and protected GSS_API negotiation mechanism (SPNEGO) provides a mechanism for extending a Kerberos-based SSO environment for use in web applications. Desktop-based SSO enables service providers and desktop domains, for example Active Directory or Kerberos, to share a principal. In practice, this allows users to log in on their computer using their domain credentials and then have service providers reuse that principal during authentication, without having to reauthenticate, thus providing SSO. These components are based on the general security concepts discussed in the Overview of General Security Concepts, but they also incorporate some JBoss EAP-specific concepts in their implementation. A subsystem is a set of capabilities added to the core server by an extension. For example, different subsystems handle servlet processing, manage the EJB container, and provide JTA support. JBoss EAP offers two main management interfaces for interacting with and editing its configuration: the management console and the management CLI. Both interfaces expose the functionality of the core management of JBoss EAP. These interfaces offer two ways to access the same core management system. The management CLI is a command-line administration tool for JBoss EAP. The management CLI may be used to start and stop servers, deploy and undeploy applications, configure system settings, and perform other administrative tasks. Operations can be performed in batch mode, allowing multiple tasks to be run as a group. The management CLI may also connect to the domain controller in a managed domain to execute management operations on the domain. The management CLI can perform all tasks that the web-based administration tool can perform as well as many other lower-level operations that are unavailable to the web-based administration tool. RBAC is disabled by default for JBoss EAP. Application constraints define sets of resources and attributes that can be accessed by Deployer users. By default, the only enabled application constraint is core, which includes deployments and deployment overlays. Application constraints are also included, but not enabled by default, for data sources, logging, mail, messaging, naming, resource adapters, and security. These constraints allow Deployer users to not only deploy applications, but also configure and maintain the resources that are required by those applications. The elytron subsystem is new in JBoss EAP 7.1. It is based on the WildFly Elytron project, which is a security framework used to unify security across the entire application server. The elytron subsystem enables a single point of configuration for securing both applications and the management interfaces. WildFly Elytron also provides a set of APIs and SPIs for providing custom implementations of functionality and integrating with the elytron subsystem. Improved architecture that allows for SecurityIdentities to be propagated across security domains. This ensures transparent transformation that is ready to be used for authorization. This transformation takes place using configurable role decoders, role mappers, and permission mappers. A secure credential store that replaces the previous vault implementation to store plain text strings. The new elytron subsystem exists in parallel to the legacy security subsystem and legacy core management authentication. Both the legacy and Elytron methods can be used for securing the management interfaces as well as providing security for applications. The architectures of Elytron and the legacy security subsystem that is based on PicketBox are very different. With Elytron, an attempt was made to create a solution that allows you to operate in the same security environments in which you currently operate; however, this does not mean that every PicketBox configuration option has an equivalent configuration option in Elytron. If you are not able to find information in the documentation to help you achieve similar functionality using Elytron that you had when using the legacy security implementation, you can find help in one of the following ways. If you have a Red Hat Development subscription, you have access to Support Cases, Solutions, and Knowledge Articles on the Red Hat Customer Portal. You can also open a case with Technical Support and get help from the WildFly community as described below. If you do not have a Red Hat Development subscription, you can still access Knowledge Articles on the Red Hat Customer Portal. You can also join the user forums and live chat to ask questions of the WildFly community. The WildFly community offerings are actively monitored by the Elytron engineering team. The concept behind the architecture and design of the elytron subsystem is using smaller components to assemble a full security policy. By default, JBoss EAP provides implementations for many components, but the elytron subsystem also allows you to provide specialized, custom implementations. Each implementation of a component in the 'elytron' subsystem is handled as an individual capability. This means that different implementations can be mixed, matched and modeled using distinct resources. A capability is a piece of functionality used in JBoss EAP and is exposed using the management layer. One capability can depend on other capabilities and this dependency is mediated by the management layer. Some capabilities are provided automatically by JBoss EAP, but the full set of available capabilities available at runtime are determined using the JBoss EAP configuration. The management layer validates that all capabilities required by other capabilities are present during server startup as well as when any configuration changes are made. Capabilities integrate with JBoss Modules and extensions, but they are all distinct concepts. A capability is depended on another capability to function, therefore it must always be present. An optional aspect of a capability depends on another capability, which can or can not be enabled. Therefore the requirement cannot be determined or known until the configuration is analyzed. A capability will check if the required capability exists at runtime. If the required capability is present it will be used. If the required capability is not present, it will not be used. You can find more information on capabilities and requirements in the WildFly documentation. Elytron provides a set of security APIs and SPIs so that other subsystems and consumers can use them directly, which reduces integration overhead. While the majority of users will use the provided functionality of JBoss EAP, the Elytron APIs and SPIs can also be used by custom implementations to replace or extend Elytron functionality. A security domain is the representation of a security policy which is backed by one or more security realms and a set of resources that perform transformations. A security domain produces a SecurityIdentity. The SecurityIdentity is used by other resources that perform authorizations, such as an application. A SecurityIdentity is the representation of the current user, which is based on the raw AuthorizationIdentity and its associated roles and permissions. You can also configure a security domain to allow inflow of a SecurityIdentity from another security domain. When an identity is inflowed, it retains its original raw AuthorizationIdentity, and a new set of roles and permissions are assigned to it, creating a new SecurityIdentity. Deployments are limited to using one Elytron security domain per deployment. Scenarios that may have required multiple legacy security domains can now be accomplished using a single Elytron security domain. Security realms provide access to an identity store and are used to obtain credentials. These credentials allow authentication mechanisms to obtain the raw AuthorizationIdentity for performing authentication. They also allow authentication mechanisms to perform verification when doing validation of evidence. You can associate one or more security realms with a security domain. Some security realm implementations also expose an API for modifications, meaning the security realm can make updates to the underlying identity store. A role decoder is associated with a security domain and is used to decode the current user’s roles. The role decoder takes the raw AuthorizationIdentity returned from the security realm and converts its attributes into roles. A role mapper applies a role modification to an identity. This can range from normalizing the format of the roles to adding or removing specific roles. A role mapper can be associated with both security realms as well as security domains. In cases where a role mapper is associated with a security realm, the role mapping will be applied at the security realm level before any transformations, such as role decoding or additional role mapping, occur at the security domain level. If a role mapper and another transformation, such as a role decoder, are both configured in a security domain, all other transformations are performed before the role mapper is applied. A permission mapper is associated with a security domain and assigns a set of permissions to a SecurityIdentity. A principal transformer can be used in multiple locations within the elytron subsystem. A principal transformer can transform or map a name to another name. A principal decoder can be used in multiple locations within the elytron subsystem. A principal decoder converts an identity from a Principal to a string representation of the name. For example, the X500PrincipalDecoder allows you to convert an X500Principal from a certificate’s distinguished name to a string representation. A realm mapper is associated with a security domain and is used in cases where a security domain has multiple security realms configured. 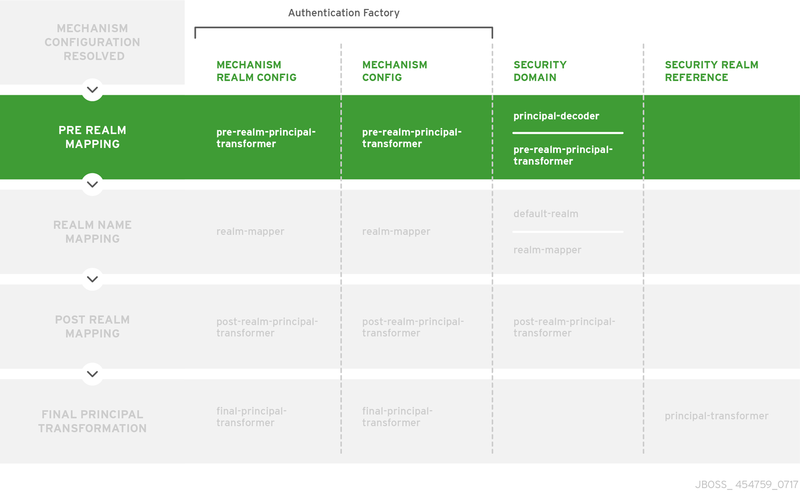 The realm mappers can be also associated with mechanism or mechanism-realm of http-authentication-factory and sasl-authentication-factory. 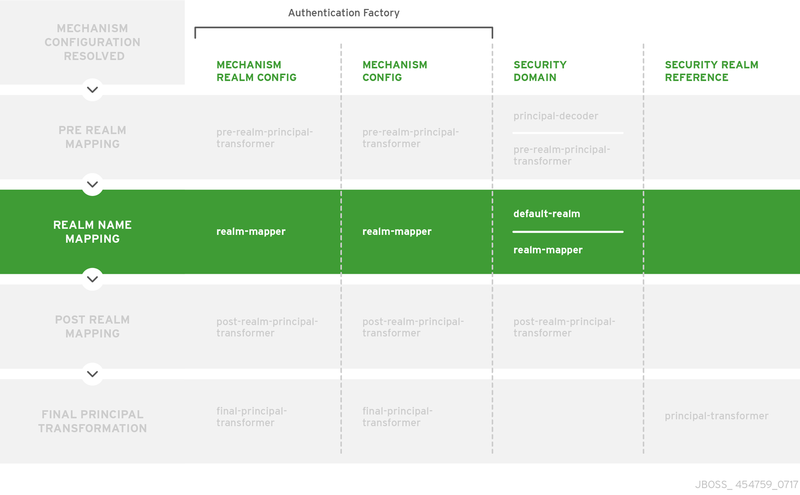 The realm mapper uses the name provided during authentication to choose a security realm for authentication and obtaining the raw AuthorizationIdentity. An authentication factory is a representation of an authentication policy. An authentication is associated with security domain, mechanism factory, and a mechanism selector. The security domain provides the SecurityIdentity to be authenticated, the mechanism factory provides the server-side authentication mechanisms, and the mechanism selector is used to obtain configuration specific to the mechanism selected. The mechanism selector can include information about realm names a mechanism should present to a remote client plus additional principal transformers and realm mappers to use during the authentication process. A key-store is the definition of a keystore or truststore including the type of keystore, its location, and credential for accessing it. A key-manager references a key-store and is used in conjunction with an SSL context. A trust-manager references as truststore, which is defined in a key-store, and is used in conjunction with an SSL context, usually for two-way SSL/TLS. The SSL context defined within the elytron subsystem is a javax.net.ssl.SSLContext meaning it can be used by anything that uses an SSL context directly. In addition to the usual configuration for an SSL context it is possible to configure additional items such as cipher suites and protocols. The SSL context will wrap any additional items that are configured. The previous vault implementation used for plain text string encryption has been replaced with a newly designed credential store. In addition to the protection for the credentials it stores, the credential store is used to store plain text strings. Multiple principal transformers, realm mappers, and a principal decoder can be defined within the elytron subsystem. 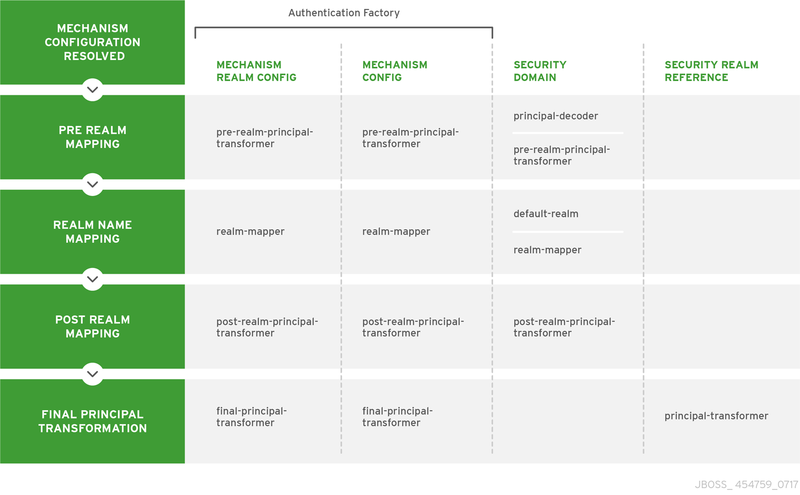 The following sections discuss how these components function during the authentication process, and how principals are mapped to the appropriate security realm. The appropriate mechanism configuration is determined and configured. The incoming principal is mapped into a SecurityIdentity. This SecurityIdentity is used to determine the appropriate security realm. After the security realm has been identified the principal is transformed again. One final transformation occurs to allow for mechanism-specific transformations. The following image demonstrates these steps, highlighted in the left column, along with showing the components used in each phase. If this procedure results in a null principal, then an error will be thrown and authentication will terminate. If the RealmMapper returns null, or if no mapper is available, then the default-realm on the security domain will be used. 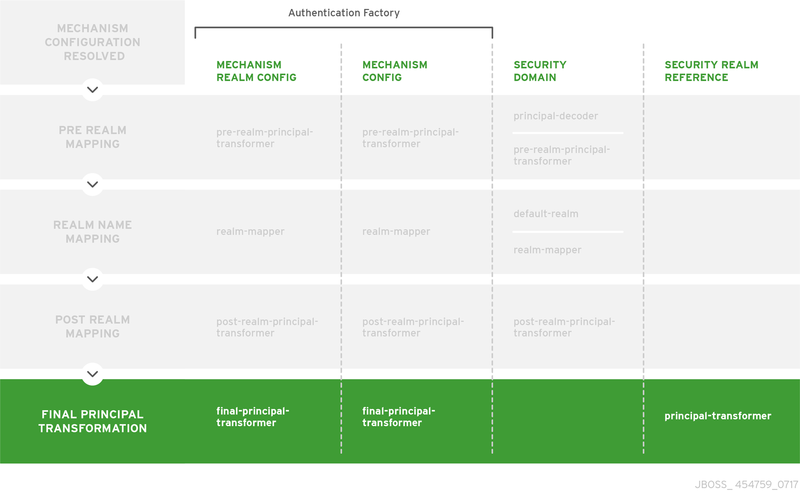 After the final round of principal transformation, the security realm identified in realm name mapping is called to obtain a realm identity used to continue authentication. Elytron provides a complete set of HTTP authentication mechanisms including BASIC, FORM, DIGEST, SPNEGO, and CLIENT_CERT. HTTP authentication is handled using the HttpAuthenticationFactory, which is both an authentication policy for using HTTP authentication mechanisms as well as factory for configured authentication mechanisms. The security domain that any mechanism authentication will be performed against. The general factory for server-side HTTP authentication mechanisms. You can use this to supply additional configuration for the authentication mechanisms. The purpose of the MechanismConfigurationSelector is to obtain configuration specific for the mechanism selected. This can include information about realm names a mechanism should present to a remote client, additional principal transformers, and realm mappers to use during the authentication process. SASL is a framework for authentication that separate the authentication mechanism itself from the protocol it uses. It also allows for additional authentication mechanisms such as DIGEST-MD5, GSSAPI, OTP, and SCRAM. SASL authentication is not part of Java EE 7. SASL authentication is handled using the SaslAuthenticationFactory, which is both an authentication policy for using SASL authentication mechanisms as well as a factory for configured authentication mechanisms. The general factory for server-side SASL authentication mechanisms. You can map some of the major components of both the legacy security subsystem components as well as the legacy core management authentication to Elytron capabilities. This allows those legacy components to be used in an Elytron based configuration and allow for an incremental migration from legacy components. An HTTP server factory definition where the HTTP server factory is an aggregation of other HTTP server factories. An HTTP server factory definition that wraps another HTTP server factory and applies the specified configuration and filtering. A SASL server factory definition that wraps another SASL server factory and applies the specified configuration and filtering. A custom credential SecurityFactory definition. Resource containing the association of a security domain with a HttpServerAuthenticationMechanismFactory. For more information, see Configure Authentication with Certificates in How to Configure Identity Management for JBoss EAP. A security factory for obtaining a GSSCredential for use during authentication. For more information, see Configure the Elytron Subsystem in How to Set Up SSO with Kerberos for JBoss EAP. A SASL server factory definition that enables filtering by provider where the factory was loaded using a provider. An HTTP server factory definition where the HTTP server factory is an aggregation of factories from the provider list. A SASL server factory definition where the SASL server factory is an aggregation of factories from the provider list. Resource containing the association of a security domain with a SASL server factory. For more information, see Secure the Management Interfaces with a New Identity Store in How to Configure Server Security for JBoss EAP. An HTTP server factory definition where the HTTP server factory is an aggregation of factories identified using a ServiceLoader. A SASL server factory definition where the SASL server factory is an aggregation of factories identified using a ServiceLoader. Individual transformers attempt to transform the original principal until one returns a non-null principal. A principal transformer definition where the principal transformer always returns the same constant. A custom principal transformer definition. A regular expression based principal transformer. Definition of a custom principal decoder. Definition of a X500 attribute based principal decoder. Definition of a constant realm mapper that always returns the same value. Definition of a custom realm mapper. Definition of a realm mapper implementation that first uses a regular expression to extract the realm name, this is then converted using the configured mapping of realm names. Definition of a simple realm mapper that attempts to extract the realm name using the capture group from the regular expression, if that does not provide a match then the delegate realm mapper is used instead. The exported legacy security domain cannot be used as Elytron security realm for the authorization step of the aggregate-realm. A realm definition that enables caching to another security realm. The caching strategy is Least Recently Used, where the least accessed entries are discarded when the maximum number of entries is reached. For more information, see Set Up Caching for Security Realms in How to Configure Identity Management for JBoss EAP. A custom realm definitions can implement either the s SecurityRealm interface or the ModifiableSecurityRealm interface. Regardless of which interface is implemented management operations will not be exposed to manage the realm. However other services that depend on the realm will still be able to perform a type check and cast to gain access to the modification API. A simple security realm definition backed by the file system. For more information, see Configure Authentication with a Filesystem-Based Identity Store in How to Configure Identity Management for JBoss EAP. For more information, see Configure Authentication with a Database-Based Identity Store in How to Configure Identity Management for JBoss EAP. A security realm definition backed by a keystore. 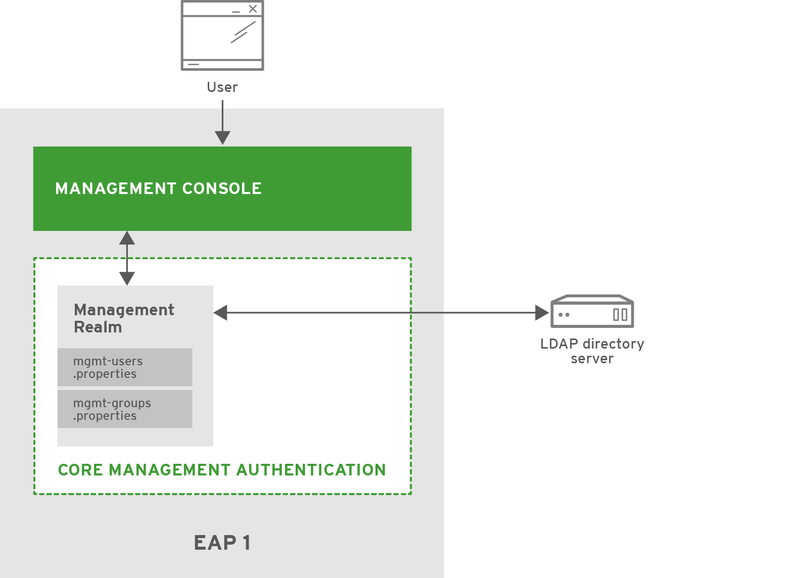 For more information, see Configure Authentication with a LDAP-Based Identity Store in How to Configure Identity Management for JBoss EAP. Configure Authentication with a Properties File-Based Identity Store in How to Configure Identity Management for JBoss EAP. Definition of a custom permission mapper. Definition of a custom RoleDecoder. A role mapper definition for a role mapper that adds a prefix to each provided. Definition of a custom role mapper. A role mapper definition for a role mapper that performs a logical operation using two referenced role mappers. For more information, see Using a client-ssl-context in How to Configure Server Security for JBoss EAP. A filtering keystore definition, which provides a keystore by filtering a key-store. For more information, see Using a filtering-key-store in How to Configure Server Security for JBoss EAP. A key manager definition for creating the key manager list as used to create an SSL context. For more information, see Enable One-way SSL/TLS for the Management Interfaces Using the Elytron Subsystem in How to Configure Server Security for JBoss EAP. An LDAP keystore definition, which loads a keystore from an LDAP server. For more information, see Using an ldap-key-store in How to Configure Server Security for JBoss EAP. An SSL context for use on the server side of a connection. A trust manager definition for creating the TrustManager list as used to create an SSL context. For more information, see Enable Two-way SSL/TLS for the Management Interfaces using the Elytron Subsystem in How to Configure Server Security for JBoss EAP. An aggregation of two or more provider-loader resources. An individual authentication configuration definition, which is used by clients deployed to JBoss EAP and other resources for authenticating when making a remote connection. An individual authentication context definition, which is used to supply an ssl-context and authentication-configuration when clients deployed to JBoss EAP and other resources make a remoting connection. For more information, see Create a Credential Store in How to Configure Server Security for JBoss EAP. A definition for a provider loader. A definition of a security property to be set. A security realm is an identity store of usernames, passwords, and group membership information that can be used when authenticating users in EJBs, web applications, and the management interface. Initially, JBoss EAP comes preconfigured with two security realms by default: ManagementRealm and ApplicationRealm. Both security realms use the file system to store mappings between users and passwords and users and group membership information. They both use a digest mechanism by default when authenticating. The JBoss EAP installation contains a script that enables administrators to add users to both realms. When users are added in this way, the username and hashed password are stored in the corresponding usernames and passwords properties file. When a user attempts to authenticate, JBoss EAP sends back a one-time use number, nonce, to the client. The client then generates a one-way hash using its username, password, nonce, and a few other fields, and sends the username, nonce, and one-way hash to JBoss EAP. JBoss EAP looks up the user’s prehashed password and uses it, along with the provided username, nonce, and a few other fields, to generate another one-way hash in the same manner. If all the same information is used on both sides, including the correct password, hashes will match and the user is authenticated. Although security realms use the digest mechanism by default, they may be reconfigured to use other authentication mechanisms. On startup, the management interfaces determine which authentication mechanisms will be enabled based on what authentication mechanisms are configured in ManagementRealm. Configuring the JBoss EAP management console for communication only using one-way SSL/TLS provides increased security. All network traffic between the client and management console is encrypted, which reduces the risk of security attacks, such as a man-in-the-middle attack. Anyone administering a JBoss EAP instance has greater permissions on that instance than non-privileged users, and using one-way SSL/TLS helps protect the integrity and availability of that instance. When configuring one-way SSL/TLS with JBoss EAP, authority-signed certificates are preferred over self-signed certificates because they provide a chain of trust. Self-signed certificates are permitted but are not recommended. The jboss-cli script authenticates automatically as local jboss user if the server is running on the same machine. By default local jboss user is a member of the SuperUser group. The authentication and authorization managers handle authentication and authorization. The mapping manager handles adding, modifying, or deleting information from a principal, role, or attribute before passing the information to the application. The auditing manager allows users to configure provider modules to control the way that security events are reported. In most cases, administrators should need to focus only on setting up and configuring security domains in regards to updating the configuration of the security subsystem. Outside of security domains, the only security element that may need to be changed is deep-copy-subject-mode. See the Security Management section for more information on deep copy subject mode. A security domain is a set of Java Authentication and Authorization Service (JAAS) declarative security configurations that one or more applications use to control authentication, authorization, auditing, and mapping. Four security domains are included by default: jboss-ejb-policy, jboss-web-policy, other, and jaspitest. The jboss-ejb-policy and jboss-web-policy security domains are the default authorization mechanisms for the JBoss EAP instance. They are used if an application’s configured security domain does not define any authentication mechanisms. Those security domains, along with other, are also used internally within JBoss EAP for authorization and are required for correct operation. The jaspitest security domain is a simple JASPI security domain included for development purposes. You can also configure the type of authentication cache to be used by a security domain, using the cache-type attribute. If this attribute is removed, no cache will be used. The allowed values for this property are default or infinispan. A deployment should be associated with either a single Elytron security domain or one or more legacy PicketBox security domain. A deployment should not be associated with both. That is an invalid configuration. An exception occurs if a deployment is associated with more than one Elytron security domain, whereas a deployment can be associated with multiple legacy security domains. When working with PicketBox, the security domain encapsulates both access to the underlying identity store and the mapping for authorization decisions. Thus, users of PicketBox with different stores are required to use different security domains for different sources. In Elytron, these two functions are separated. Access to the stores is handled by security realms and mapping for authorization is handled by security domains. So, a deployment requiring independent PicketBox security domains does not necessarily require independent Elytron security domains. Security realms and security domains can be used to secure web applications deployed to JBoss EAP. When deciding if either should be used, it is important to understand the difference between the two. Web applications and EJB deployments can only use security domains directly. They perform the actual authentication and authorization using login modules using the identity information passed from an identity store. Security domains can be configured to use security realms for identity information; for example, other allows applications to specify a security realm to use for authentication and getting authorization information. They can also be configured to use external identity stores. Web applications and EJB deployments cannot be configured to directly use security realms for authentication. The security domains are also part of the security subsystem and are loaded after core services. Only the core management, for example the management interfaces and the EJB remoting endpoints, can use the security realms directly. They are identity stores that provide authentication as well as authorization information. They are also a core service and are loaded before any subsystems are started. The out-of-the-box security realms, ManagementRealm and ApplicationRealm, use a simple file-based authentication mechanism, but they can be configured to use other mechanisms. Security mapping adds the ability to combine authentication and authorization information after the authentication or authorization happens but before the information is passed to your application. Roles for authorization, principals for authentication, or credentials which are attributes that are not principals or roles, may all be mapped. Role mapping is used to add, replace, or remove roles to the subject after authentication. Principal mapping is used to modify a principal after authentication. You can use credential mapping to convert attributes from an external system to be used by your application. You can also use credential mapping conversely, to convert attributes from your application for use by an external system. The LdapExtended login module searches for the user as well as the associated roles to bind for authentication. The roles query recursively and follow DNs to navigate a hierarchical role structure. The login module options include whatever options are supported by the chosen LDAP JNDI provider supports. The RunAs login module is a helper module that pushes a run-as role onto the stack for the duration of the login phase of authentication; it then pops the run-as role from the stack in either the commit or abort phase. The purpose of this login module is to provide a role for other login modules that must access secured resources to perform their authentication, for example, a login module that accesses a secured EJB. The RunAs login module must be configured ahead of the login modules that require a run as role established. The RealmDirect login module allows an existing security realm to be used in making authentication and authorization decisions. When configured, this module will look up identity information using the referenced realm for making authentication decisions and mapping user roles. For example, the preconfigured other security domain that ships with JBoss EAP has a RealmDirect login module. If no realm is referenced in this module, the ApplicationRealm security realm is used by default. Most login modules must compare a client-supplied password to a password stored in a user management system. These modules generally work with plain text passwords, but they can be configured to support hashed passwords to prevent plain text passwords from being stored on the server side. JBoss EAP supports the ability to configure the hashing algorithm, encoding, and character set. It also defines when the user password and store password are hashed. If the deep copy subject mode is disabled, which it is by default, copying a security data structure makes a reference to the original rather than copying the entire data structure. This behavior is more efficient, but it is prone to data corruption if multiple threads with the same identity clear the subject by means of a flush or logout operation. Java Authentication SPI for Containers (JASPI or JASPIC) is a pluggable interface for Java applications and is defined in JSR-196. In addition to JAAS authentication, JBoss EAP allows for JASPI authentication to be used. JASPI authentication is configured using login modules in a security domain, and those modules may be stacked. The jaspitest security domain is a simple JASPI security domain that is included by default for development purposes. The web-based management console does not expose the configuration of JASPI authentication modules. Applications deployed to JBoss EAP require a special authenticator to be configured in their deployment descriptors to use JASPI security domains. Fine-grained authorization allows administrators to adapt to the changing requirements and multiple variables involved in the decision making process for granting access to a module. As a result, fine-grained authorization can become complex. The ApplicationDomain security domain uses ApplicationRealm and groups-to-roles for authentication. It also uses default-permission-mapper to assign the login permission. The ApplicationRealm security realm is a properties realm that authenticates principals using application-users.properties and assigns roles using application-roles.properties. These files are located under jboss.server.config.dir, which by default, maps to EAP_HOME/standalone/configuration. They are also the same files used by the legacy security default configuration. The application-http-authentication http-authentication-factory can be used for doing authentication over HTTP. It uses the global provider-http-server-mechanism-factory to filter authentication mechanism and uses ApplicationDomain for authenticating principals. It accepts BASIC and FORM authentication mechanisms and exposes BASIC as Application Realm to applications. The application-sasl-authentication sasl-authentication-factory can be used for authentication using SASL. It uses the configured sasl-server-factory to filter authentication mechanisms, which also uses the global provider-sasl-server-factory to filter by provider names. application-sasl-authentication uses the ApplicationDomain security domain for authentication of principals. This is used to filter sasl-authentication-factory is used based on the mechanism name. In this case, configured will match on JBOSS-LOCAL-USER and DIGEST-MD5. It also sets the wildfly.sasl.local-user.default-user to $local. The default-permission-mapper mapper is a constant permission mapper that uses org.wildfly.security.auth.permission.LoginPermission to assign the login permission and org.wildfly.extension.batch.jberet.deployment.BatchPermission to assign permission for batch jobs. The batch permissions are start, stop, restart, abandon, and read which aligns with javax.batch.operations.JobOperator. This is used to filter which sasl-authentication-factory is used based on the provider. In this case, elytron will match on the WildFlyElytron provider name. This is the HTTP server factory mechanism definition used to list the supported authentication mechanisms when creating an HTTP authentication factory. This is the SASL server factory definition used to create SASL authentication factories. The groups-to-roles mapper is a simple-role-decoder that will decode the groups information of a principal and use it for the role information. The local mapper is a constant role mapper that maps to the local security realm. This is used to map authentication to the local security realm. The local security realm does no authentication and sets the identity of principals to $local. The ManagementDomain security domain uses two security realms for authentication: ManagementRealm with groups-to-roles and local with super-user-mapper. It also uses default-permission-mapper to assign the login permission. The ManagementRealm security realm is a properties realm that authenticates principals using mgmt-users.properties and assigns roles using mgmt-roles.properties. These files are located under jboss.server.config.dir, which by default, maps to EAP_HOME/standalone/configuration. They are also the same files used by the legacy security default configuration. The management-http-authentication http-authentication-factory can be used for doing authentication over HTTP. It uses the global provider-http-server-mechanism-factory to filter authentication mechanism and uses ManagementDomain for authenticating principals. It accepts the DIGEST authentication mechanisms and exposes it as ManagementRealm to applications. The management-sasl-authentication sasl-authentication-factory can be used for authentication using SASL. It uses the configured sasl-server-factory to filter authentication mechanisms, which also uses the global provider-sasl-server-factory to filter by provider names. management-sasl-authentication uses the ManagementDomain security domain for authentication of principals. It also maps authentication using JBOSS-LOCAL-USER mechanisms using the local realm mapper and authentication using DIGEST-MD5 to ManagementRealm. The super-user-mapper mapper is a constant role mapper that maps the SuperUser role to a principal. For securing applications, JBoss EAP comes preconfigured with application-http-authentication for using HTTP and application-sasl-authentication for using SASL. The application-http-authentication http-authentication-factory uses ApplicationDomain which uses ApplicationRealm and groups-to-roles for authentication. ApplicationRealm is a properties-realm backed by application-users.properties and application-roles.properties for username, password, and role information. For securing the management interfaces, JBoss EAP comes preconfigured with management-http-authentication for HTTP and management-sasl-authentication for SASL. The management-http-authentication http-authentication-factory uses ManagementDomain which uses ManagementRealm and groups-to-roles for authentication. ManagementRealm is a properties-realm backed by mgmt-users.properties and mgmt-roles.properties for username, password, and role information. The management-sasl-authentication sasl-authentication-factory uses ManagementDomain which uses local for JBOSS-LOCAL-USER authentication and ManagementRealm for DIGEST-MD5 authentication. 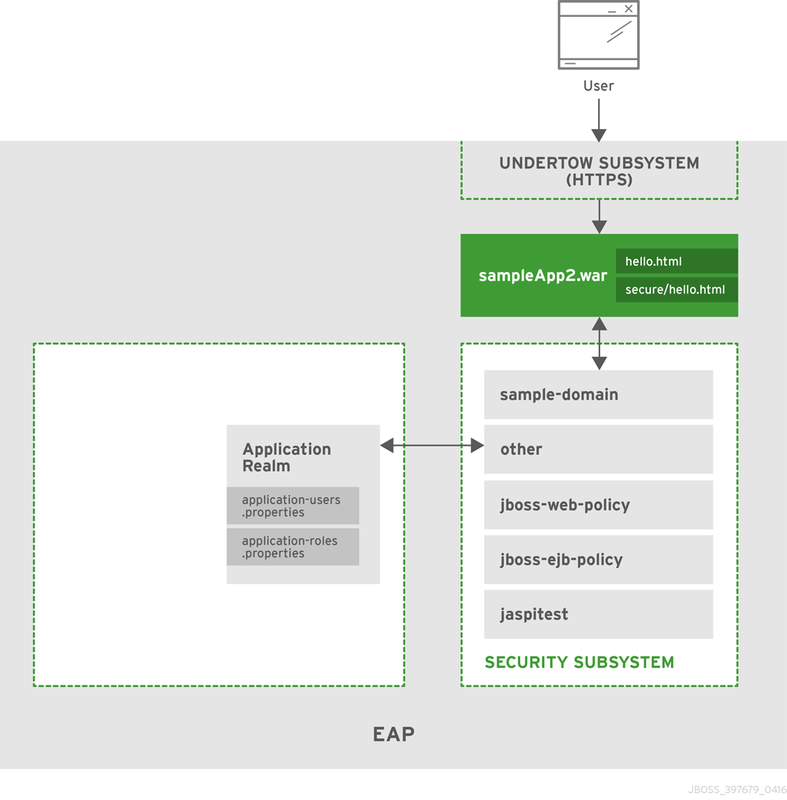 On startup, the JBoss EAP instance loads all four authentication factories and their associated security domains, security realms, and other configured components. If anyone attempts to access the management interface with the management CLI using JBOSS-LOCAL-USER, in other words running the management CLI from the same host as the JBoss EAP instance, the user will be directed to the management-sasl-authentication sasl-authentication-factory which will attempt to authenticate the user with ManagementDomain using the local security realm. If Susan attempts to access the management interface using the management CLI from a different host, she will be using the DIGEST-MD5 authentication mechanism with SASL. She will be directed to the management-sasl-authentication sasl-authentication-factory which will attempt to authenticate the user with ManagementDomain using the ManagementRealm security realm. If Susan attempts to access the management interface using the web-based management console, she will be using the DIGEST authentication mechanism with HTTP. She will be directed to the management-http-authentication http-authentication-factory which will attempt to authenticate the user with ManagementDomain using the ManagementRealm security realm. The application sampleApp1.war has two HTML files, /hello.html and /secure/hello.html, and uses BASIC HTTP authentication to secure the path /secure/*. It uses the Application Realm and requires the role of sample. When a user attempts to access sampleApp1.war, they are directed to the application-http-authentication http-authentication-factory. It will attempt to authenticate the user with ApplicationDomain using the ApplicationRealm security realm. This scenario shows how JBoss EAP is secured when using Elytron for SSL/TLS with both management interfaces and applications. JBoss EAP provides the ability to secure both the management interfaces as well as applications with SSL/TLS. With Elytron, this configuration is now unified so you now have the option to secure both the management interfaces and applications with the same SSL/TLS configuration. SSL/TLS is configured in Elytron by creating a key-store, key-manager, and server-ssl-context. SSL/TLS is enabled for the management interfaces by setting secure-socket-binding on the http-interface and by assigning the server-ssl-context to the management interfaces. This enables the management interfaces to use SSL/TLS for HTTP traffic. SSL/TLS is enabled for applications by assigning the server-ssl-context to the https-listener in the undertow subsystem. For more background information on SSL/TLS see the Advanced Security section. On startup, JBoss EAP loads the management interfaces as part of the core services, which also starts the http-interface, configured for SSL/TLS for the management interfaces. It also starts the undertow subsystem, which is configured for SSL/TLS for applications, and the elytron subsystem which provides the SSL/TLS configuration through the server-ssl-context. Both the management interfaces and applications can then be accessed over the secure ports with SSL/TLS enabled. 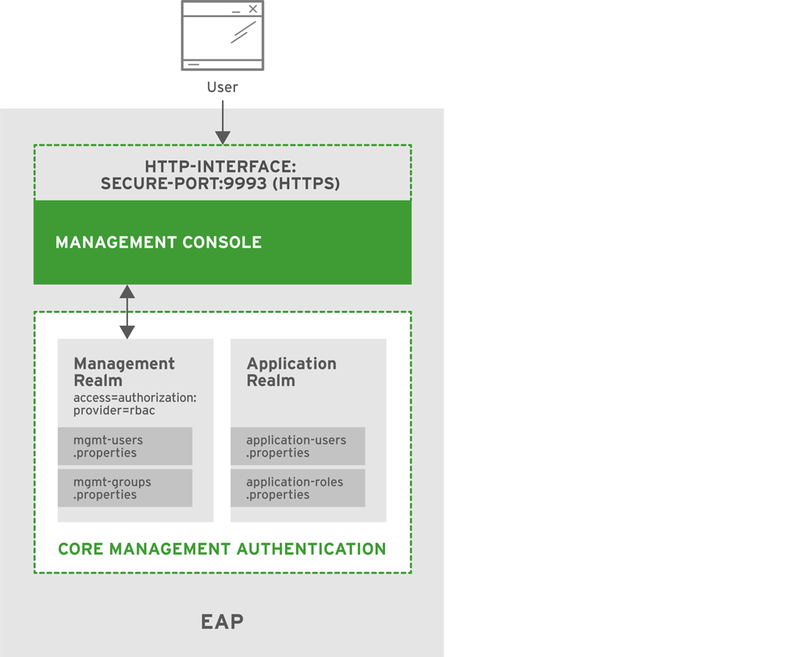 This scenario shows how both the management interfaces and applications in JBoss EAP are secured with a new identity store in Elytron. An application, sampleApp2.war, is deployed to JBoss EAP and is configured to use basicExampleDomain. 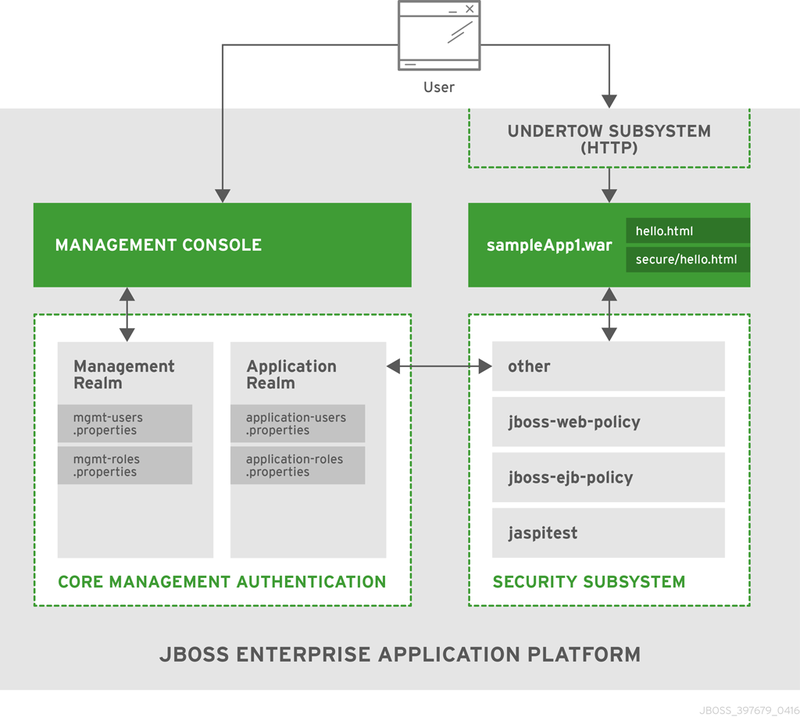 JBoss EAP provides the ability to secure both the management interfaces as well as applications with identity stores beyond ManagementRealm and ApplicationRealm. With Elytron, the same identity store can be used to secure the management interfaces as well as applications, but you also still have the option to set up separate identity stores for each. An identity store is represented by a security realm, for example a filesystem-realm, jdbc-realm, or ldap-realm. For the purposes of this example, a filesystem-realm named exampleRealm has been created. A security domain named exampleDomain has also been created which uses exampleRealm as an identity store, the groups-to-roles role mapper to decode the group information provided by exampleRealm into roles, and default-permission-mapper for mapping permissions. For HTTP authentication, an http-authentication-factory called exampleHttpAuthFactory has been created. It uses the global HTTP server factory mechanism and exampleDomain for authentication. It also has two mechanism configurations. One that uses the BASIC authentication method exposed as basicExampleDomain, and one that uses the DIGEST authentication method exposed as digestExampleDomain. The HTTP management interface has been configured to use exampleHttpAuthFactory. The undertow subsystem has also been configured with a new application-security-domain which also uses exampleHttpAuthFactory. The application sampleApp2.war is configured to use basicExampleDomain with BASIC authentication. For SASL authentication a sasl-authentication-factory called exampleSaslAuthFactory has been created. It uses the configured SASL server factory and exampleDomain for authentication. It also has a DIGEST-MD5 authentication mechanism configured which is exposed as digestMD5ExampleDomain. The SASL configuration for the management interfaces has been set to use exampleSaslAuthFactory. On startup, JBoss EAP loads the core services and starts the undertow and elytron subsystems. This secures the management interfaces and exposes basicExampleDomain, digestExampleDomain, and digestMD5ExampleDomain for applications deployed to JBoss EAP. When sampleApp2.war is loaded, it looks for basicExampleDomain to provide authentication and authorization for its secured URLs. It has two HTML files, /hello.html and /secure/hello.html, and uses BASIC authentication to secure the path /secure/*. It requires the role of sample to access any secure URLs. When users authenticate, their credentials are submitted using a specific mechanism depending on how they are accessing JBoss EAP. For instance, if a user attempts to access the management console using HTTP with DIGEST authentication, they will authenticate using the DIGEST authentication method exposed as digestExampleDomain. If they attempt to access sampleApp2.war using HTTP with BASIC authentication, they will authenticate using the BASIC authentication method exposed as basicExampleDomain. If they attempt to access the management CLI using SASL with DIGEST authentication, they will authenticate using the DIGEST-MD5 exposed as digestMD5ExampleDomain. The HTTP authentication mechanisms use exampleHttpAuthFactory, and the SASL authentication mechanism uses exampleSaslAuthFactory. Both authentication factories handle authentication and role mapping with exampleDomain. If Vincent or Issac attempt to access the management interfaces, they are prompted for their username and password. After successfully logging in, they are each able to perform management operations. When Vincent or Issac requests /hello.html, they are able to view the page without authenticating. When Vincent or Issac tries to request /secure/hello.html, they are prompted to enter a username and password. After successfully logging in, Vincent is able to view /secure/hello.html since he has the sample role but Issac will not be able to view /secure/hello.html since he has the guest role. All other users can access /hello.html without logging in, but none can access /secure/hello.html because Vincent and Issac are the only users in exampleRealm. This scenario shows how the JBoss EAP management interfaces are secured with RBAC and an identity store in the elytron subsystem. JBoss EAP offers the ability to use RBAC on the management interfaces. The concepts behind RBAC are covered in the RBAC section. This example uses a security realm called exampleRealm. The remainder of the security configuration, including role decoder, security domain, and authentication factories, are the same as in the Securing the Management Interfaces and Applications with a New Identity Store section. RBAC is enabled by setting the provider attribute to rbac for the management interface and updating the exampleRealm with the desired users and roles. On startup, JBoss EAP loads the core services and elytron subsystem, which loads the security configuration and the RBAC configuration. If RBAC was not enabled, any user in the exampleRealm is considered a SuperUser and has unlimited access. Because RBAC has been enabled, each user is now restricted based on the roles they have. Suzy, Tim, Emily, Zach, and Natalie have different roles, which are shown in the table above. For example, only Suzy and Tim can read and modify access control information. Suzy, Tim, and Emily can modify runtime state and other persistent configuration information. Zach can also modify runtime state and other persistent configuration information but only related to application resources. Suzy, Tim, Emily, Zach, and Natalie can read configuration and state information, but Natalie cannot update anything. For more details on each of the roles and how JBoss EAP handles RBAC, see the Role-Based Access Control and Adding RBAC to the Management Interfaces sections. This scenario shows how Kerberos can be used with JBoss EAP to provide SSO for web applications. A JBoss EAP instance has been created, EAP1, and is running as a standalone server. 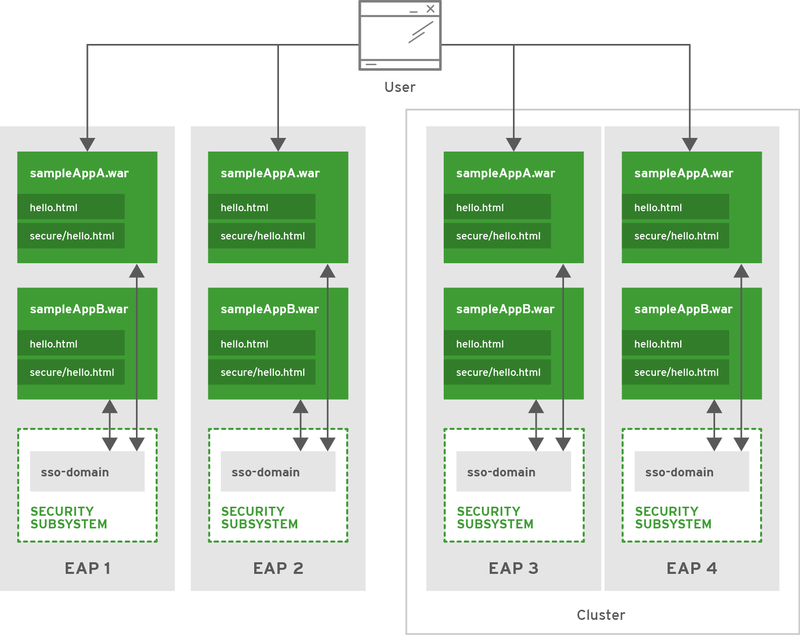 Two web applications, sampleAppA and sampleAppB, have been deployed to EAP1. Both the web applications and EAP1 have been configured to authenticate using desktop-based SSO with Kerberos. JBoss EAP provides authentication with Kerberos using the SPNEGO authentication method. For more information on the specifics of Kerberos and SPNEGO, please see the Third-Party SSO Implementations section. 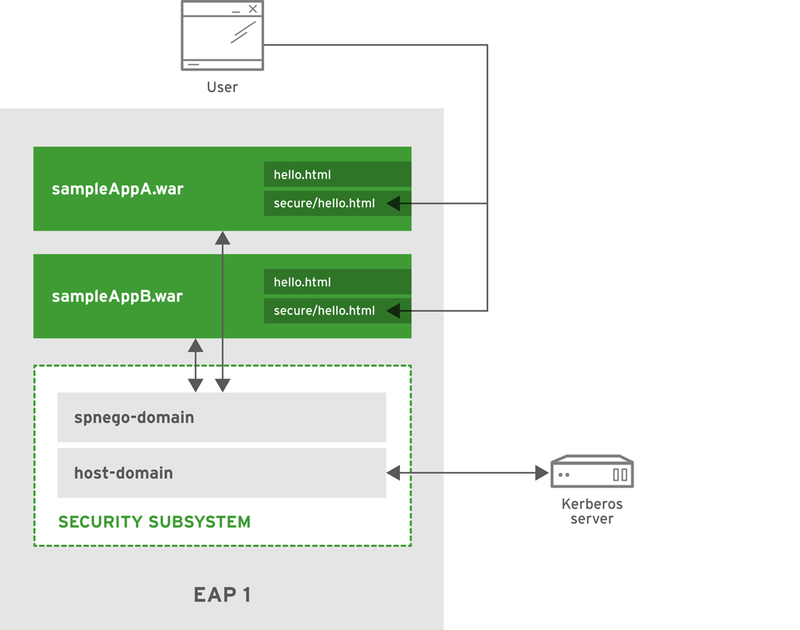 To enable JBoss EAP and deployed web applications to use Kerberos for authentication, a kerberos-security-factory is created to connect to the Kerberos server. A security realm, role mapper, and security domain are also created for assigning roles to users from the Kerberos server. An http-authentication-factory is created that uses the kerberos-security-factory and uses the security domain for authentication and role assignment. An authentication mechanism is exposed as exampleSpnegoDomain using a SPNEGO authentication mechanism. The undertow subsystem is also configured to use the http-authentication-factory for authentication. Both sampleAppA and sampleAppB are configured to use exampleSpnegoDomain to perform authentication and get a user’s roles for authorization. Both applications can also be configured with FORM authentication as a fallback authentication mechanism in case the security tokens cannot be passed from the operating system to the browser. If FORM authentication is configured as a fallback, an additional authentication mechanism, along with a supporting security domain, must be configured. This authentication mechanism is independent of Kerberos and SPNEGO and only has to support FORM authentication. In this case, an additional mechanism and supporting security domain have been configured for FORM authentication and exposed as exampleFormDomain. Each application is configured to use a exampleFormDomain and to provide FORM authentication as a fallback. Each application is also configured to secure the path /secure/* and supplies its own list of roles for handling authorization. On startup, EAP1 loads the core services, followed by the elytron and other subsystems. The kerberos-security-factory establishes a connection to the Kerberos server. 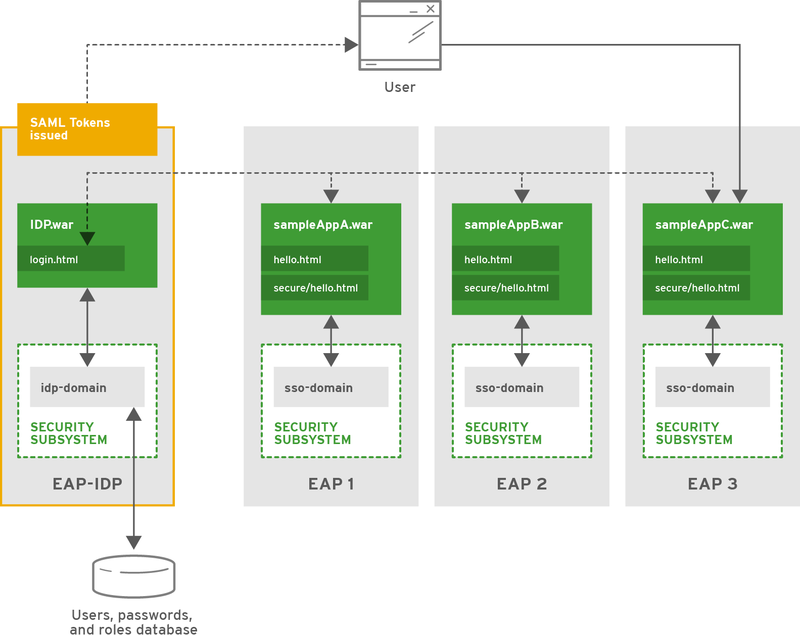 Both sampleAppA and sampleAppB are deployed and connect to exampleSpnegoDomain and exampleFormDomain for authentication. Sande has logged in to a computer that is secured with Kerberos. She opens a browser and attempts to access sampleAppA/secure/hello.html. Because that is secured, authentication is required. EAP1 directs the browser to send a request for a key to the Kerberos server, specifically the Kerberos Key Distribution Center that is configured on her computer. After the browser obtains a key, it is sent to sampleAppA. sampleAppA sends the ticket using exampleSpnegoDomain to JBoss EAP where it is unpacked and authentication is performed in conjunction with the configured Kerberos server in the kerberos-security-factory. Once the ticket is authenticated, Sande’s role is passed back to sampleAppA to perform authorization. Because Sande has the all role, she will be able to access sampleAppA/secure/hello.html. If Sande tries to access sampleAppB/secure/hello.html, the same process will occur. She will be granted access, due to her having the all role. Andrea and Betty would follow the same process, but with Andrea only having access to sampleAppA/secure/hello.html and not sampleAppB/secure/hello.html. Betty would be the opposite, having access to sampleAppB/secure/hello.html and not sampleAppA/secure/hello.html. Chuck would pass authentication to either sampleAppA/secure/hello.html or sampleAppB/secure/hello.html but would not be granted access to either because he does not have any roles. If Sande were to attempt to access sampleAppA/secure/hello.html from a computer not secured by Kerberos, for example a personal laptop connected to the office network, she would be directed to the FORM login page as a fallback. Her credentials would then be authenticated using the fallback authentication mechanism and the process would continue with authorization. One way of understanding how JBoss EAP security and its components work together is to review real scenarios. The following sections cover several generalized but realistic situations that involve the various JBoss EAP security components and configuration options. They focus on how an application or set of applications is secured as well as how the management interfaces are secured. On startup, JBoss EAP loads the ManagementRealm, with the RBAC configuration, and management interfaces as part of the core services, which also starts the http-interface, configured for HTTPS, for the management interfaces. Users now access the management interfaces via HTTPS, and RBAC has also been enabled and configured. If RBAC is not enabled, any user in the ManagementRealm security realm is considered a SuperUser and has unlimited access. Because RBAC has been enabled, each user is now restricted based on the roles they have. Suzy, Tim, Emily, Zach, and Natalie have different roles, which are shown in the table above. For example, only Suzy and Tim can read and modify access control information. Suzy, Tim, and Emily can modify runtime state and other persistent configuration information. Zach can also modify runtime state and other persistent configuration information but only related to application resources. Suzy, Tim, Emily, Zach, and Natalie can read configuration and state information, but Natalie cannot update anything. For more details on each of the roles and how JBoss EAP handles RBAC, see the Role-Based Access Control and Adding RBAC to the Management Interfaces sections. If Jane attempts to access EAP1/sampleAppA/secure/hello.html, she will be asked to authenticate. After providing the correct information, she will be allowed to see EAP1/sampleAppA/secure/hello.html. Jane’s session will be added in the SSO caches used by the undertow and infinispan subsystems. If she attempts to access EAP1/sampleAppB/secure/hello.html, she will not be asked to reauthenticate. sampleAppB running on EAP1 will find her session using the undertow subsystem caches, along with the infinispan subsystem, and grant her access because she is already authenticated. If Jane attempts to access either EAP2/sampleAppA/secure/hello.html or EAP2/sampleAppB/secure/hello.html, she will be asked to authenticate again because EAP1 and EAP2 do not share a cache. If Jane attempts to access EAP3/sampleAppA/secure/hello.html, she will be asked to authenticate and her session will be stored in the SSO caches. These caches are stored across the entire cluster, so if Jane attempts to log into EAP3/sampleAppB/secure/hello.html, EAP4/sampleAppA/secure/hello.html, or EAP4/sampleAppB/secure/hello.html, she will not have to reauthenticate. If either EAP3 or EAP4 are restarted, Jane’s SSO information will remain in the cache because the other JBoss EAP instance and the cluster remain running, thus preserving the cache. Similarly, if Jane’s session is invalidated, it ripples across the cache, and she will be asked to reauthenticate regardless of which application or server she tries to access in the cluster. JBoss EAP provides support for doing browser-based SSO via SAML with web applications as well as hosting an identity provider. To host an identity provider, a security domain, in this case named idp-domain, must be configured with an authentication mechanism defined. In this case, idp-domain is configured to use the DatabaseLoginModule as the authentication mechanism. The IDP application, for example IDP.war, is deployed to that JBoss EAP instance, in this example EAP-IDP, and configured to use idp-domain as its identity store. IDP.war uses the identity store in combination with functionality in the application to authenticate users as well as issue SAML tokens containing the user’s identity and role information. Three additional JBoss EAP instances: EAP1, EAP2, and EAP3, each host one distinct application that will serve as an individual SP, sampleAppA.war, sampleAppB.war, and sampleAppC respectively. Each JBoss EAP instance has a security domain, sso-domain, configured to use the SAML2LoginModule as the authentication mechanism. Each application contains functionality to support SSO, use IDP.war as an identity provider, and use HTTP/POST binding for authentication. Each application is also configured to use sso-domain to secure the path /secure/* and supplies its own list of roles for handling authorization. If Eric tries to access EAP2/sampleAppB/secure/hello.html, because he is not already authenticated against that SP, he is redirected to IDP.war with an authentication request. Because Eric has already authenticated against the IDP, he is redirected to EAP2/sampleAppB/secure/hello.html by IDP.war with a new SAML token for that SP without having to reauthenticate. sampleAppB checks his new SAML token and authorizes him based on his role. Because sampleAppB allows the roles all and AB to access /secure/* and Eric has the role all, he is allowed to access EAP2/sampleAppB/secure/hello.html. The same thing would apply if Eric were to try to access EAP3/sampleAppC/secure/hello.html. JBoss EAP offers support for using Kerberos for SSO in web applications via SPNEGO and JBoss Negotiation. For more information on the specifics of Kerberos and SPNEGO, see the Third-Party SSO Implementations section. To enable JBoss EAP and deployed web applications to use Kerberos for authentication, two security domains must be created. The first security domain, host-domain, is configured with the kerberos login module to connect to the Kerberos server. This allows JBoss EAP to authenticate at the container level. A second security domain, spnego-domain, is created with two login modules. One uses the spnego login module to connect to host-domain to authenticate users. The second can use any other login module to load role information for use in authorization decisions, for example, UsersRoles using properties files to map users to roles.